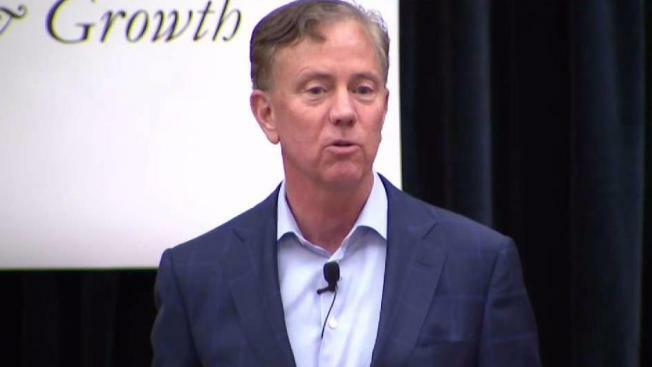 Democratic candidate for governor Ned Lamont distanced himself from some of Gov. Malloy's policies during a forum in Trumbull on Wednesday. For the first time of the primary season, endorsed Democratic candidate for governor Ned Lamont took some shots at outgoing Gov. Dannel Malloy. During a forum hosted by the Connecticut Technology Council, the conversation was focused on the economy and ways to improve it. Lamont, who never mentioned Malloy by name, criticized the state’s practice of providing cash and tax breaks to companies looking to locate to the state, or looking for a boost to stay in the state. "I think we've gone snap happy in terms of trying get and keep businesses,” Lamont said of the state’s business development strategy. He also criticized the state’s bailout for the city of Hartford, which was brokered in part by Malloy’s administration. "I'm not interested in bailouts, I didn't like that deal at all, but there have to be other ways to help our cities." In nearly the same breath, Lamont said the state of Connecticut cannot succeed unless it grows its cities. This version of Ned Lamont is new on the campaign trail. Before the Democratic State Convention last month in Hartford, he seldom ever mentioned policies or moments of the political past, insisting on looking forward and having a message to reflect that effort. Now, in some respects, the gloves could be considered off for the Greenwich businessman. He no longer needs to pander to party insiders to secure the nomination, while he instead now must appeal to registered Democrats who will vote in the August 14 primary. Malloy, according to the MorningConsult poll, is the most unpopular governor in America. However, Lamont has found some common ground with the outgoing governor, like on tolls. Lamont favors a limited electronic toll system that he could envision expanding to all cars in the future. Malloy also favors tolls. Lamont lost out to Malloy in 2010, the first time he sought the office of governor, and four years after he lost a bid to unseat Sen. Joe Lieberman in the US Senate. Lieberman lost the Democratic nomination to Lamont, but won the general election as an Independent. Lamont insists he is not feeling the political pressures of running for office, and adds he won’t make promises he can’t keep. Rather, he says he wants to be more frank with voters. "I'm in the best position to fix these things because I don't give a damn about getting reelected."